The Project includes "Eisenhower's Secret War," a two-hour documentary now appearing on public television stations nationwide, the 4-part Eisenhower Legacy DVD series, a 60-minute television special "Allied Commander," a 20-part classroom series and a video preservation project. All of these programs were written and produced by George A. Colburn, Ph.D.
Click images below to hear General Colin L. Powell (U.S. Army Ret.) preview the programs. In this first segment, learn why Ike was chosen to lead Allied forces in Africa, Italy and, as Supreme Commander, in Europe. We'll also see how he won the confidence of Churchill, Roosevelt and GI Joe as well as why, as a symbol of victory, he epitomized a glorious American ideal for a war-weary world. The forgotten years of Ike's public life are explored in this program. The story covers his role in the post-war years as Chief of Staff of the U.S. Army when America quickly demobilized its wartime military machine, his retirement from the military and appointment as President of Columbia University, his re-emergence into the public spotlight as NATO’s Supreme Commander shortly after the outbreak of the Korean War in 1950, and, finally, his decision to enter presidential politics. See how President Eisenhower handled the critical domestic issues of McCarthyism, civil rights and fiscal policy after 20 years of Democratic rule. Understand how Ike handled tricky political relations with Democrats and the powerful conservative wing of the GOP. Learn how Ike dealt with the Communist menace on both diplomatic and military fronts and through covert CIA operations. We'll also see how he used personal diplomacy and the nuclear threat to keep a fragile peace. Hosted and narrated by John Chancellor, the distinguished NBC-TV reporter and commentator. A one-hour Special on General Eisenhower's various commands in World War II, from his appointment to the War Plans Division at the war's onset to his command of the Allied armies in Europe from D-Day to V-E Day. Featured in this programs are British, French and Germany military and diplomatic officials as well as "GI Joes" who fought under Ike's command in North Africa, Sicily, Italy and northwestern Europe. "The Eisenhower Era" is a 20-part classroom series that traces Dwight D. Eisenhower's public life from 1941 - 1961 as General of the Army and President of the United States. 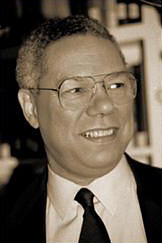 General Colin L. Powell (U.S. Army Ret.) hosts the series. The series is now available to license for streaming from Ambrose Digital 2.0 (www.ambrosedigital.com). The Eisenhower Legacy series is hosted by General Colin. L. Powell (U.S. Army Ret.). THE EISENHOWER LEGACY features interviews with key witnesses to the major events of the era. Many of them worked closely with Ike during his odyssey as America's most trusted and beloved public figure. They enrich the series with intimate details on his life and actions. These interviews are intercut with archive film and stills from American, British, French, German and Soviet sources. A few of the 150 interviewees are noted below.